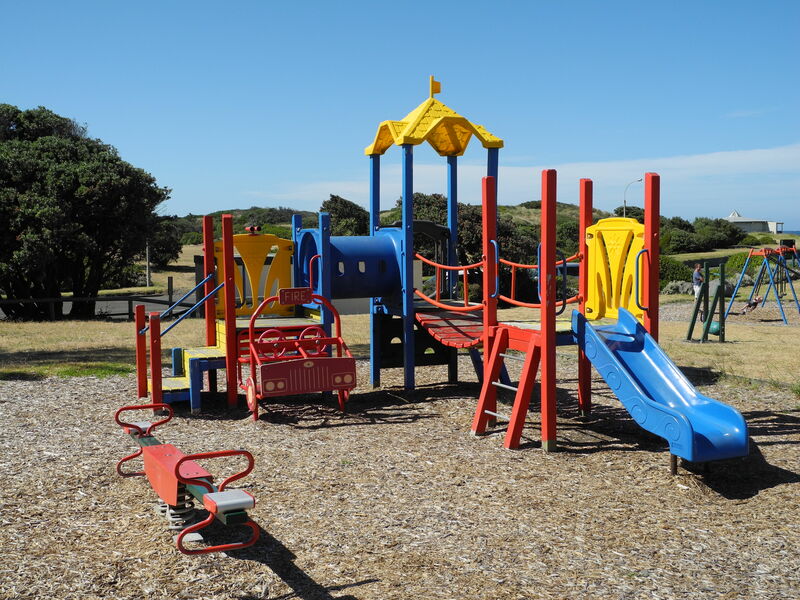 Reviews of playgrounds in Whanganui with information for parents. 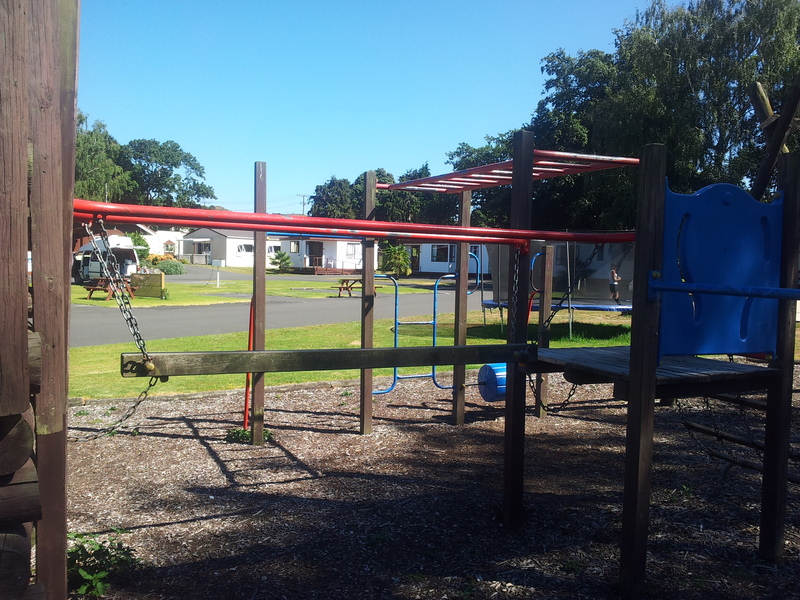 This is part of a series where I review local playgrounds in and around Whanganui. Non-locals will want to skip this! 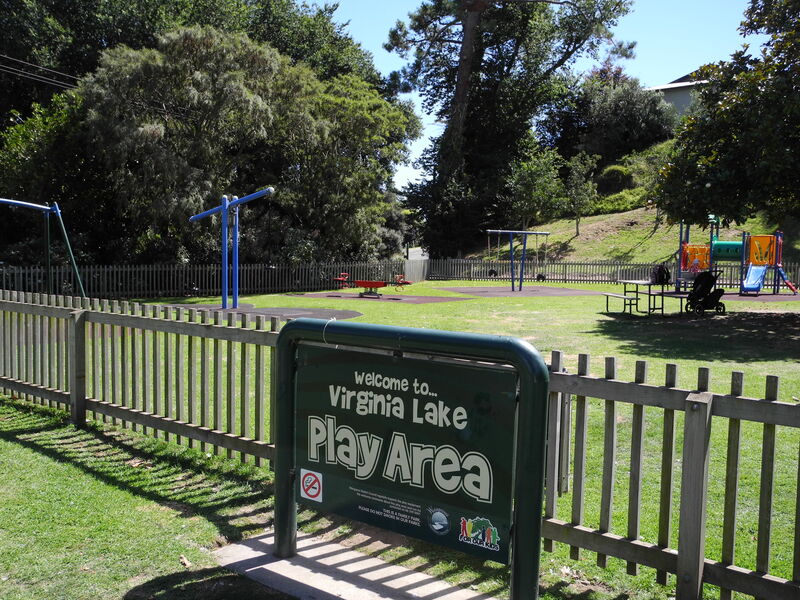 Virginia Lake is the crowning jewel in Whanganui’s tiara. 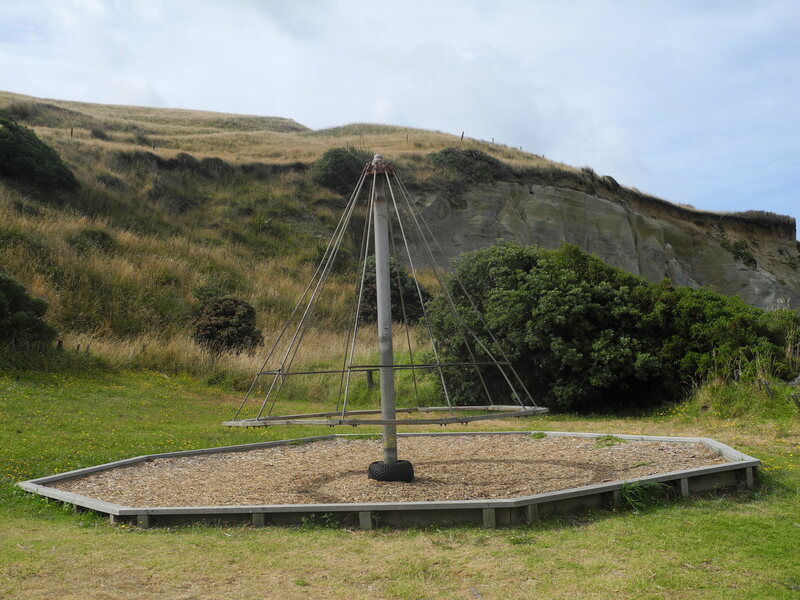 It is my favourite place to go in Whanganui and probably our best-loved tourist destination. I will do a review on the lake itself at a later date, but for now I’m focusing on the cool playground at the Lake. 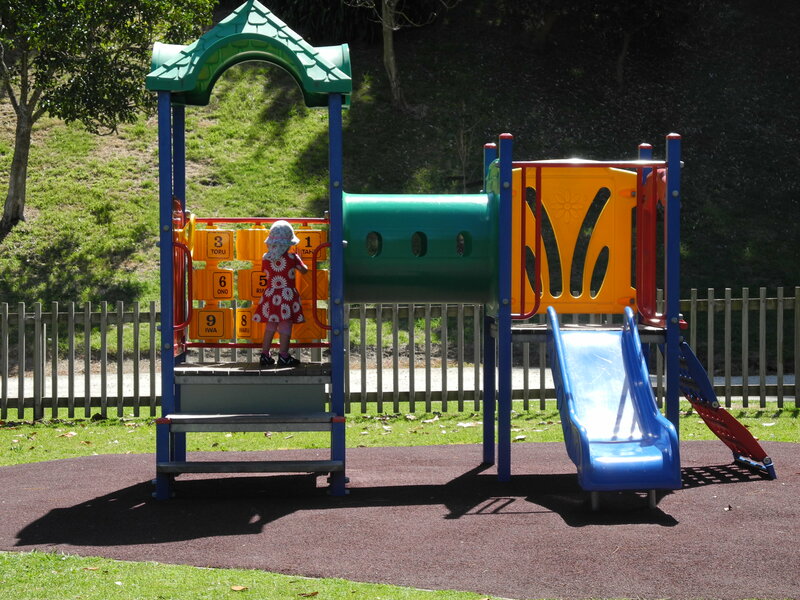 In my opinion, Virginia Lake playground is the best playground for toddlers in Whanganui. Tucked away behind the bird aviary and free barbeque to the left of the main car park, the playground can also be accessed from the Babbage Place entrance and car park (lots of people don’t know this car park exists, keep going a bit further along the road past the main car park). 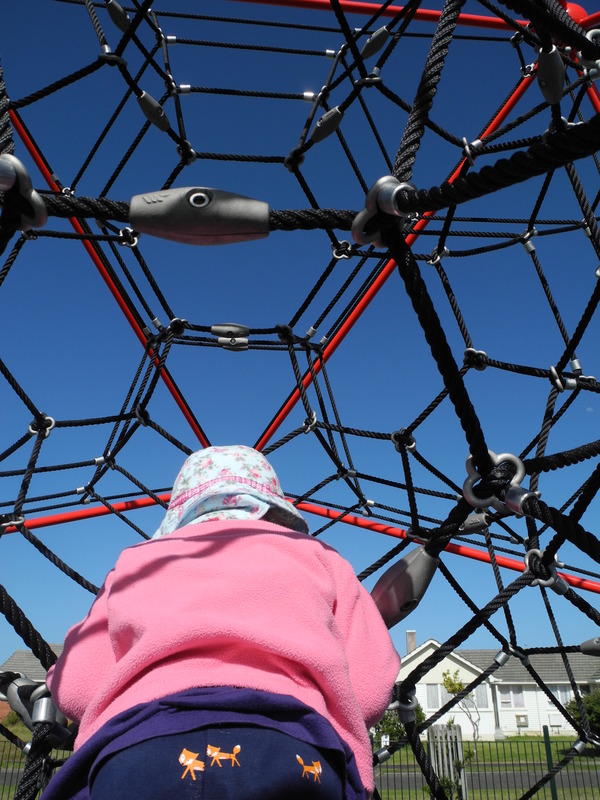 If like many parents, you have a baby as well as a toddler – this is the playground for you. The playground is fully fenced so there’s no chance of your tot doing a runner to terrorize the ducks. 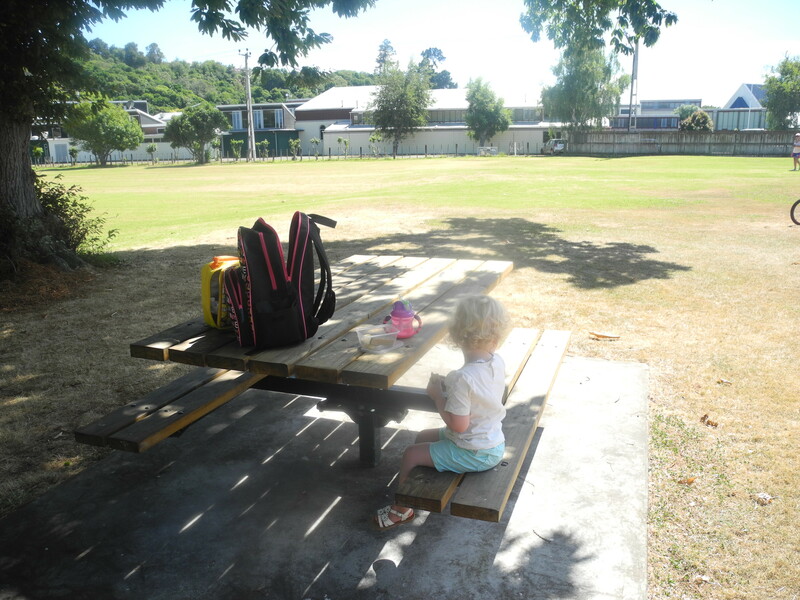 There are two picnic tables, conveniently located in the shade where you can plonk yourself and your baby if need be. There are rubbish bins just outside the play area. 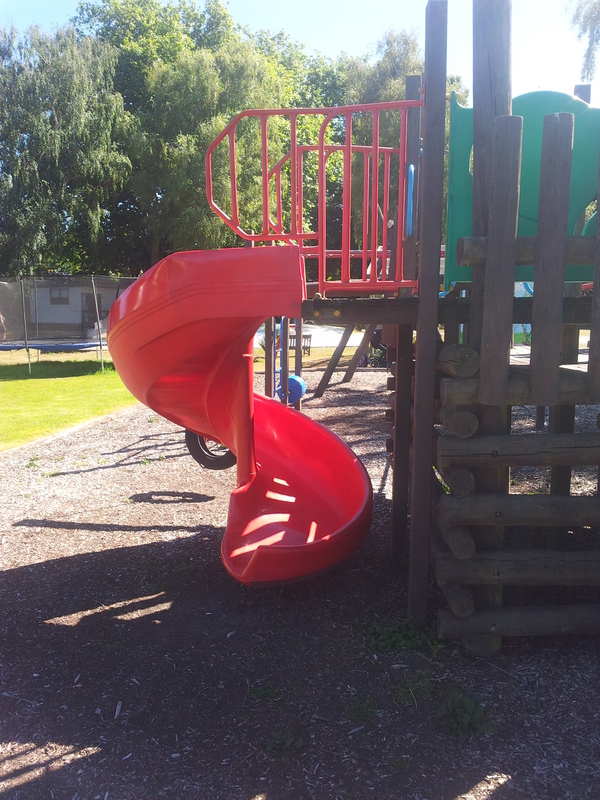 There is a standard climbing frame with slide that is exciting enough for most toddlers, and I think it’s the best climbing frame I’ve come across in a Whanganui Playground for tots who are crawling/furniture-surfing/climbing/just learning to walk. 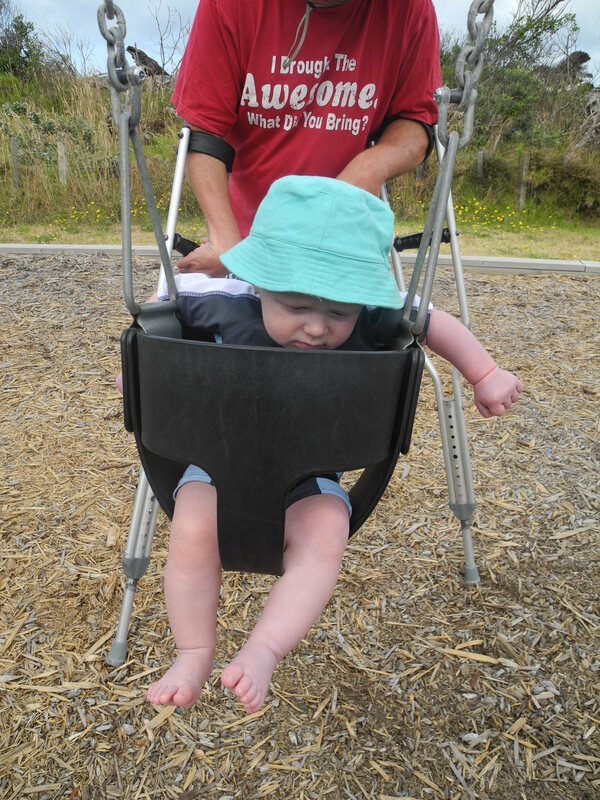 When we first came to Whanganui, Sausage was 10 months old and was only crawling, but she loved this climbing frame and was able to haul herself onto it with only a tiny bit of help from me. There are two sets of swings – one with two bucket swings, and one with a bucket and a regular swing, although the day we visited the regular swing was out of action (aside from this, everything else was in good nick). There are three different types of see-saw which is a bit over-kill, but two of them will appeal to slightly older children. There’s not heaps of play equipment, and definitely nothing to grab the attention of older kids, but it doesn’t have to because there’s the lake, ducks, the bird aviary, a fountain, some Winter Gardens, a Cafe , a grassy dell with stage, a band rotunda, several different paths to take around the lake…I could go on. If you’ve spent an hour or so at Titoki Wetland, you might want to follow it up with a quick visit to the playground just down the road. 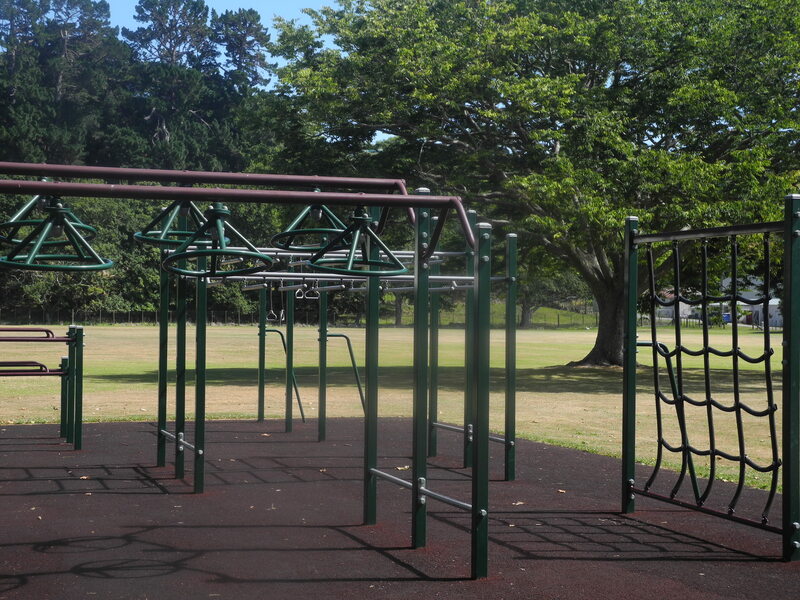 Located on the corner of Rogers St and Titoki Street, the playground is opposite Barsanti Kindergarten. The playground is small but perfectly formed. It’s fully fenced as it is located on an island that divides one side of Rogers Street from the other. 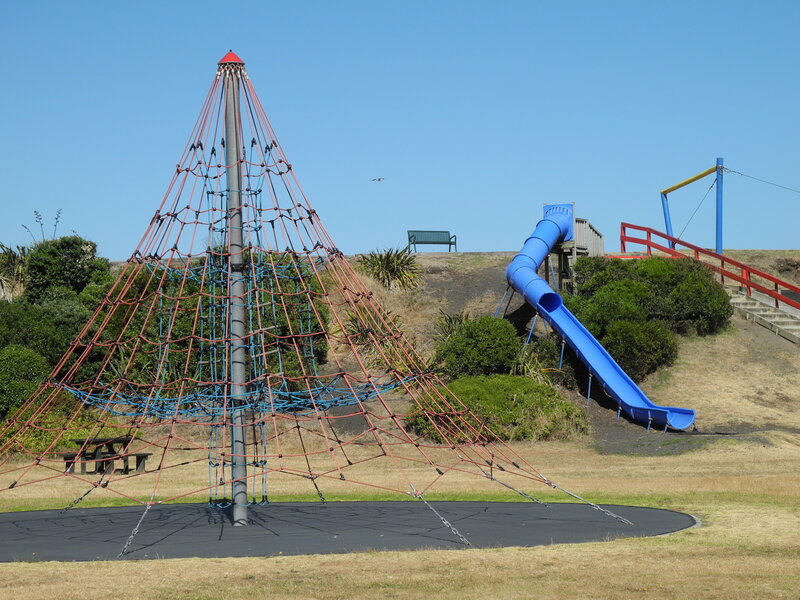 It has two regular swings and one bucket swing, a slide and an awesome spider-web climbing frame. 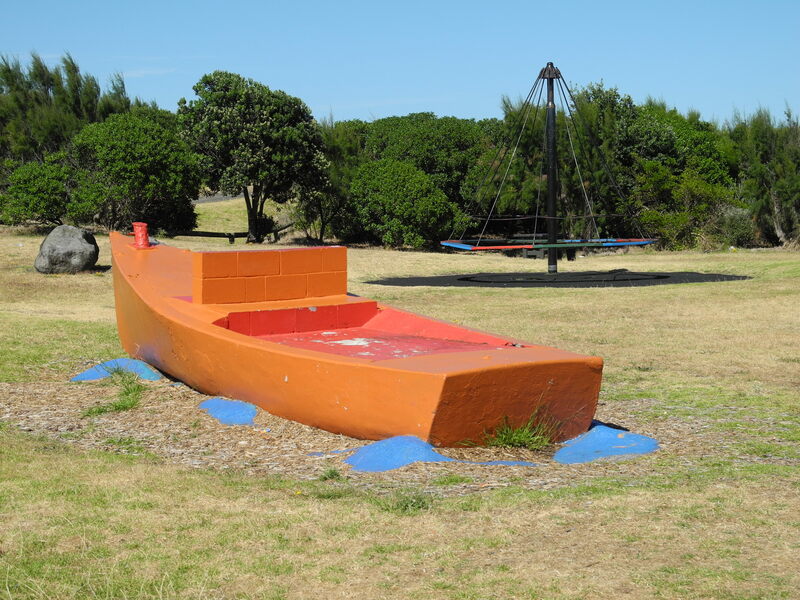 Tucked away on the side of Durie Hill is a tiny toddler’s delight, Webb Road Reserve. And when I say tiny, I mean tiny. 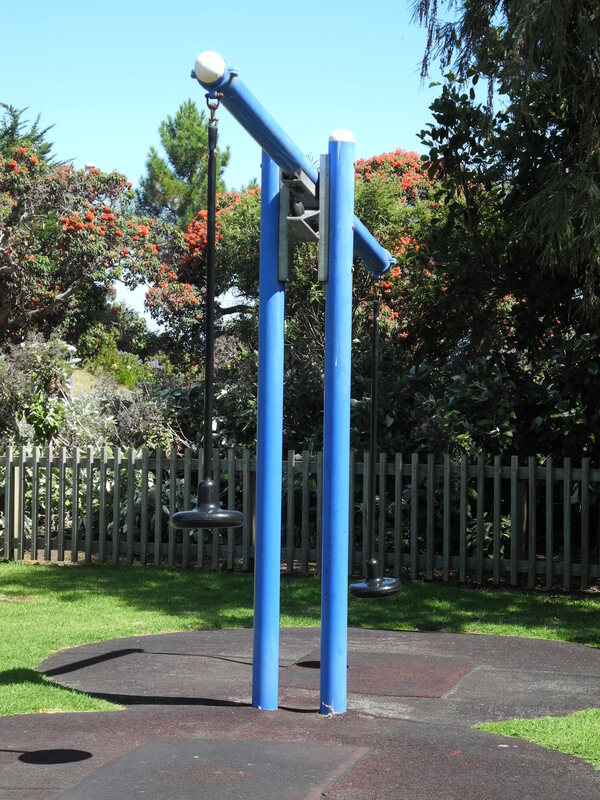 There are two swings – one bucket and one regular – and a climbing frame with wavy slide. The slide is a bit high for under two’s but Sausage got to the top with some help. There’s plenty of bark underneath the play equipment, and a couple of benches for parents to sit on. And the benches are in the SHADE! Wahoo! There’s not much green space – enough for a picnic, but not enough to kick a ball around – as the park is basically a wedge-shaped corner section. It is lovely though, surrounded by established trees and bordered by houses. 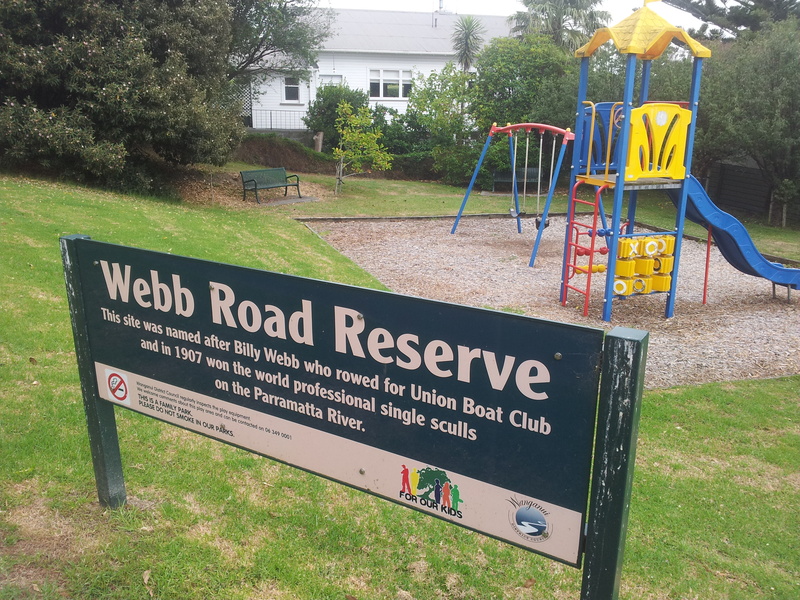 Parking is a bit tricky as Webb Road isn’t the usual wide Whanganui road. It’s more like Wellington, being a narrow, windy road – only Whanganui homes have off-street parking! As the park is on a corner you can’t really park on the road without obstructing traffic so I parked on the grass. Benches and shade. Oooh, love me some shade. 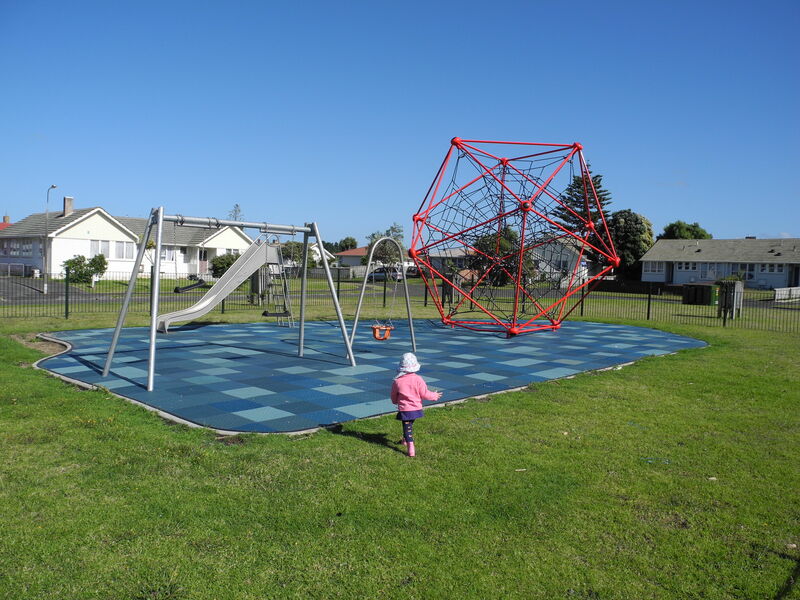 It’s small, and the play equipment is pretty generic so it’s not really the sort of place you’d make a special journey to (unless you are researching for your blog), but great if you live locally. Ah, Peat Park. 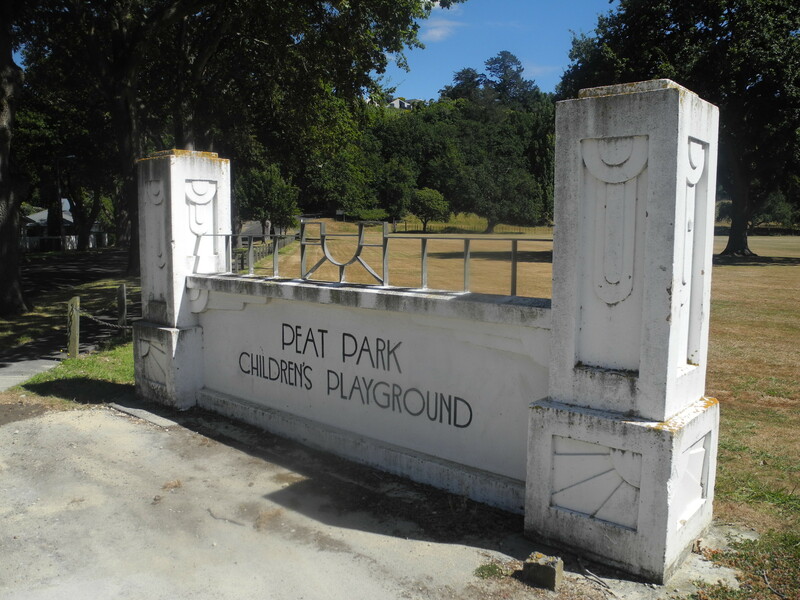 It’s one of Whanganui’s oldest playgrounds as evidenced by the Art Deco entrance. 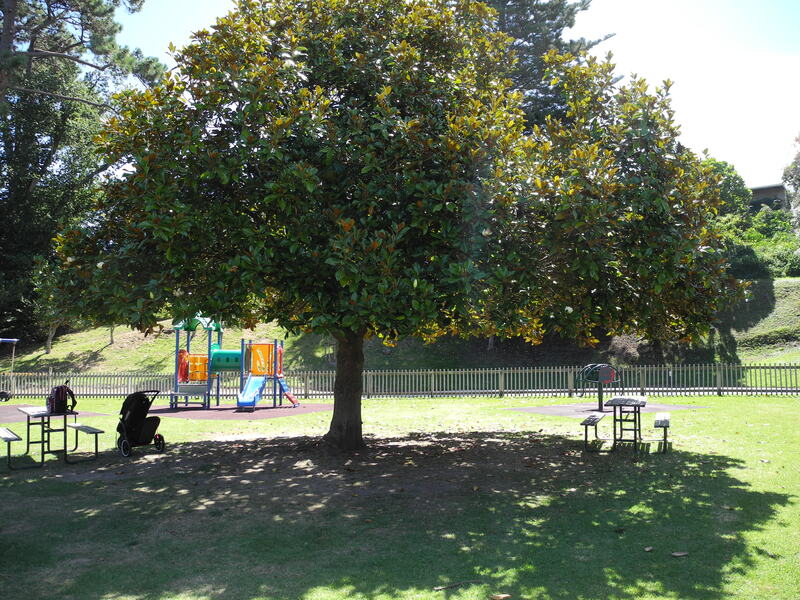 Tucked away at the foot of St John’s Hill, the park is located on the corner of Halswell St and Peat St, and is next to Cullinane College. 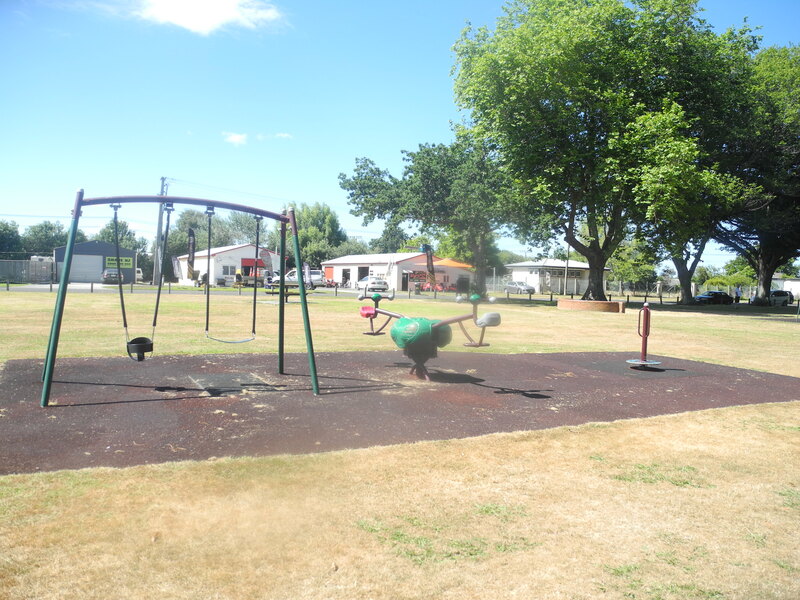 The play areas are unfenced but are a reasonable distance from the road. The streets were relatively quiet while we were there, although I imagine it gets rather busy around school drop off/pick up time. Outside of those times you should find ample parking space. Peat Park is sometimes used as a sports ground as the place is huge. 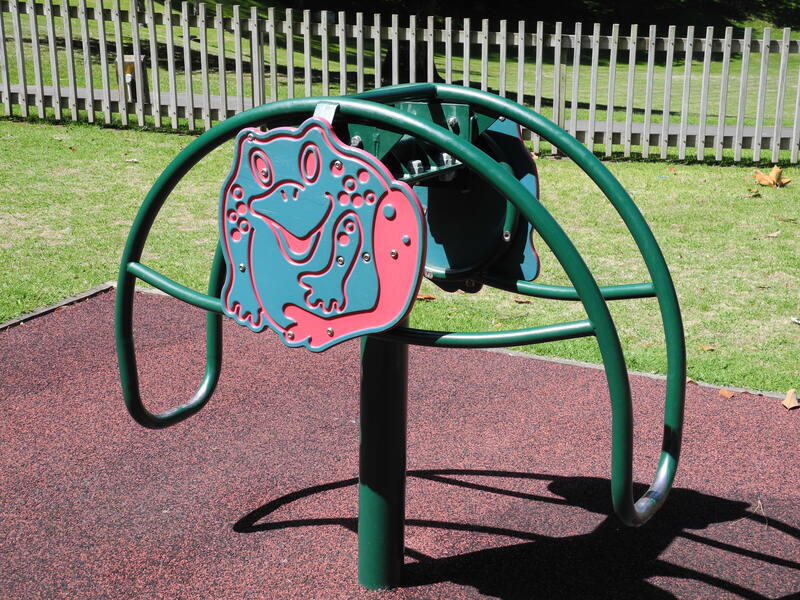 The original playground equipment is long gone, and there are now two play areas for children. 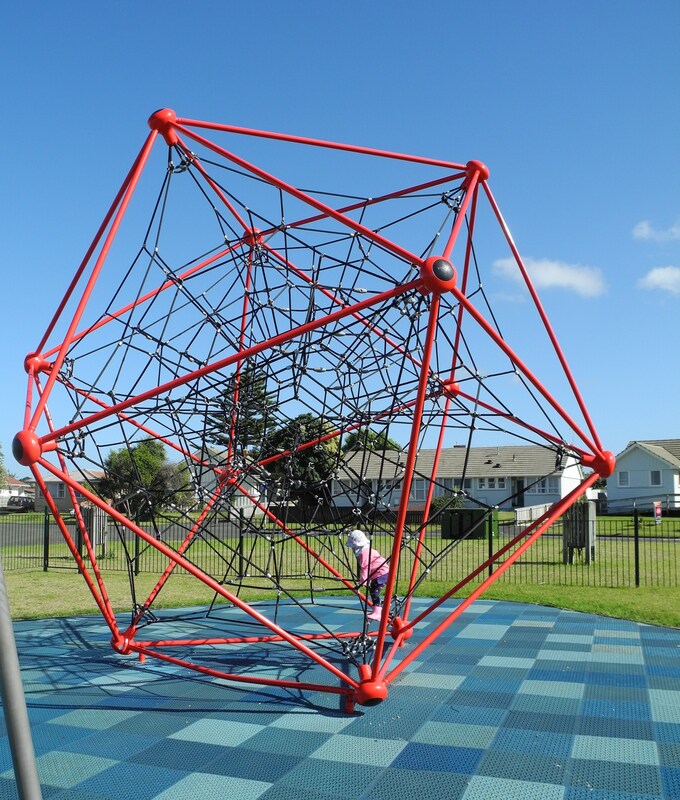 There is a massive climbing frame structure for older kids. It has an obstacle course sort of feel to it, and will probably appeal to older children as there are arm grinders to test their strength on as they go from one end of a bar to another. This structure however, left me cold. It seems rather characterless, and is definitely more the sort of structure I would expect to find being used in a school for P.E. There is a small toddlers area with two swings (one bucket, one regular), a cool bug-shaped see-saw, and a spinning pole with a platform. Sausage needed my help to use the spinning pole, but I reckon in a few months time she will be capable of using it on her own, which is always a plus in her books. 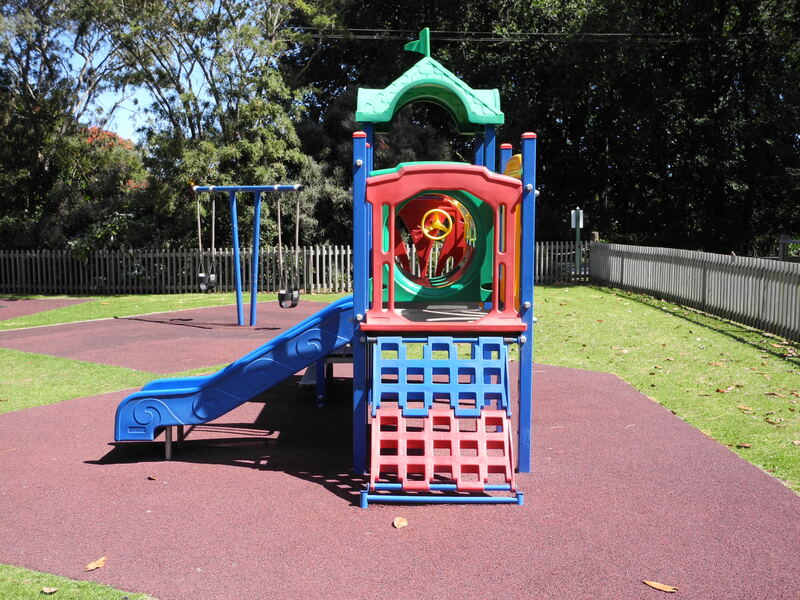 This area could do with more play equipment, such as a slide or a toddler-sized climbing frame. 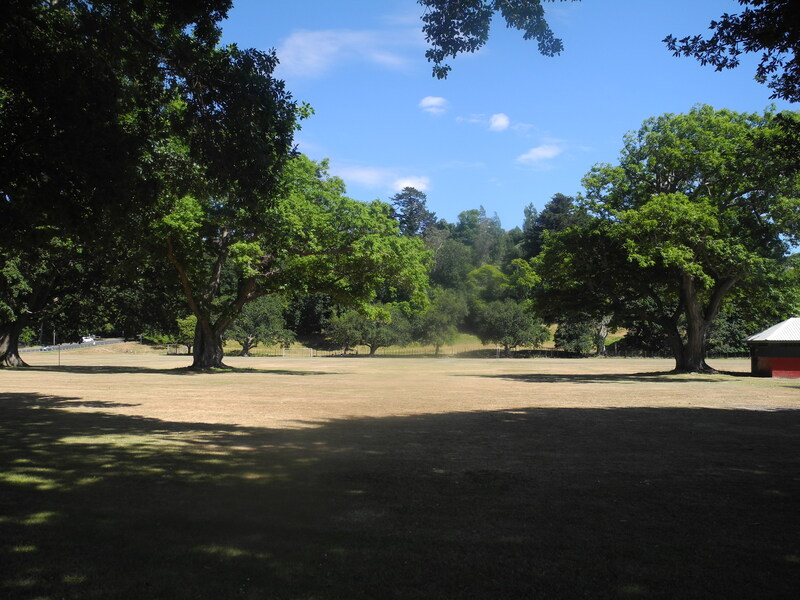 One of the reasons I have always loved this park is it lined with really old trees (mostly oak). The trees are huge and provide plenty of shade (hoorah!) 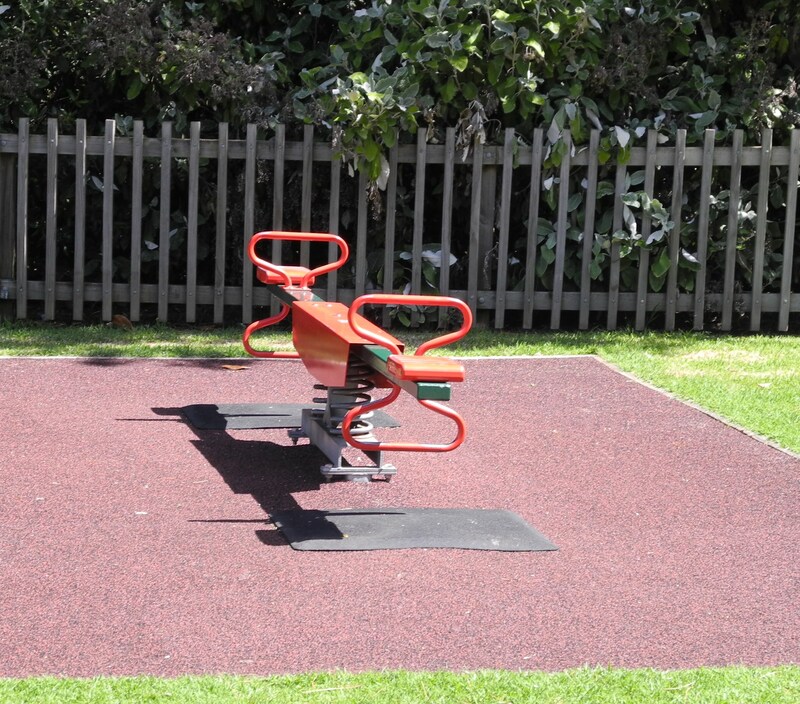 for parents to sit and watch their children at both play areas, and for those watching team sports on the playing field. 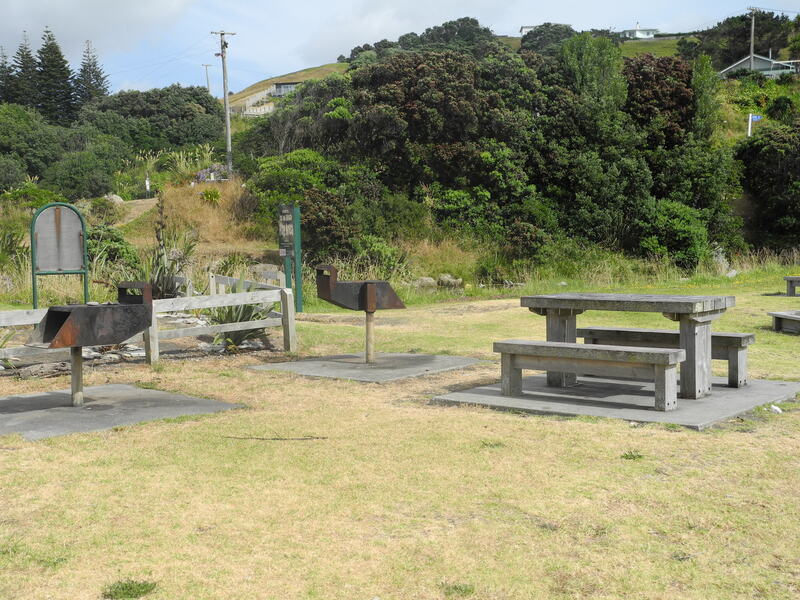 There are two picnic tables – one near each of the two play areas. There are toilets on-site, but they were closed when we visited and looked like they had been for some time. As a kid these were my favourite reason to come to Peat Park. The foot of the hill is used as a deer sanctuary, and it is a delight to be able to view these graceful creatures up close. 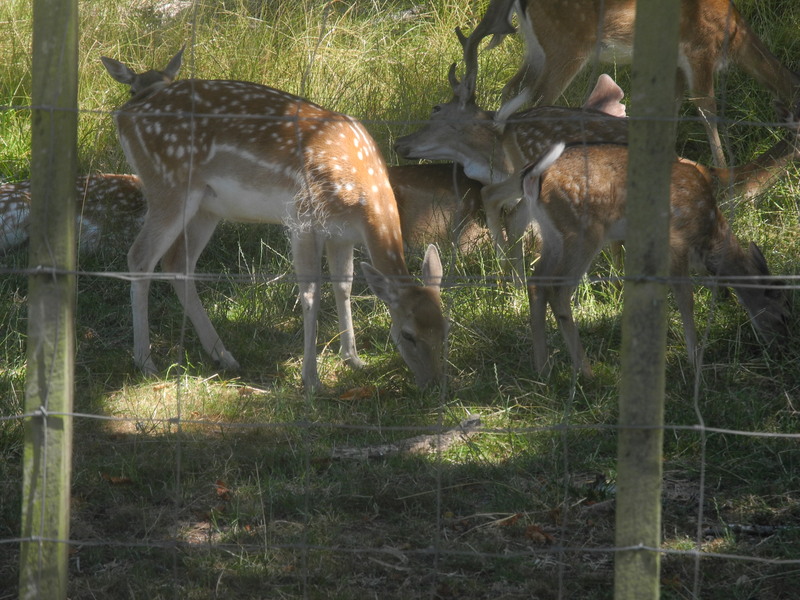 At the time of writing there were several baby deer. 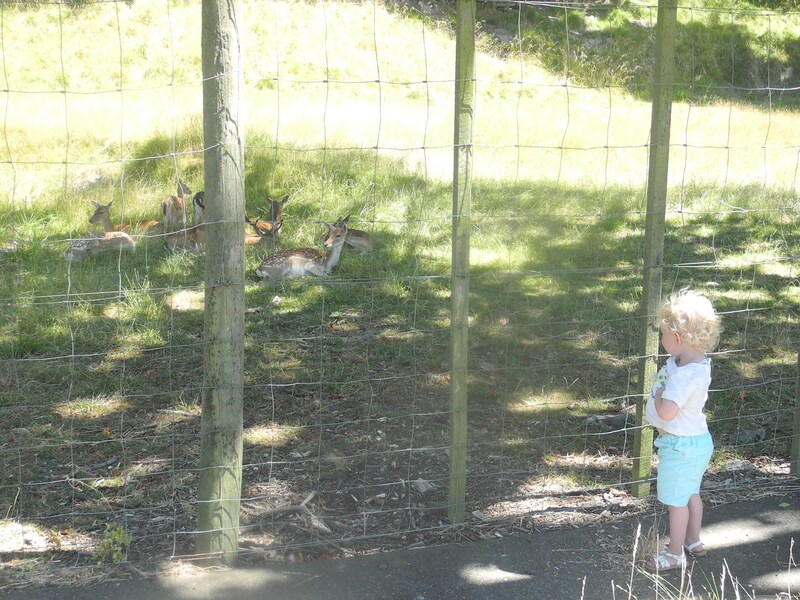 The deer are quite used to people and were not in the least perturbed by my noisy toddler squealing ‘REINDEER Mummy!’ when she saw them. The park is beautiful. Lovely established trees, wide open spaces, what’s not to like? Deer! A great chance to get your tots up close. 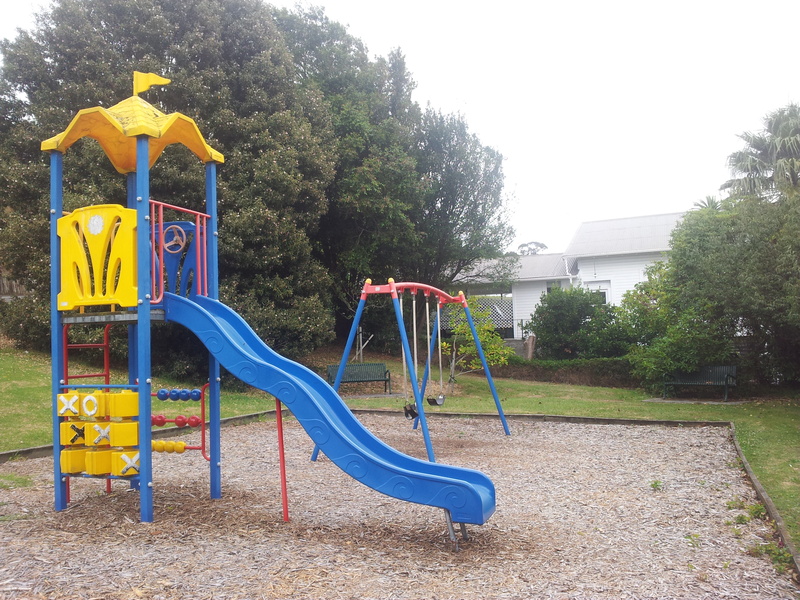 The Whanganui River Top 10 Holiday Park in Aramoho on Somme Parade, is adjacent to the playground where my brother, cousins and I were allowed to play in BY OURSELVES. We were permitted to walk there – a whole block away ON OUR OWN. Such freedom! My old stomping ground is now bereft of its flying fox, thus rendering it a rather limp and lukewarm version of the original. 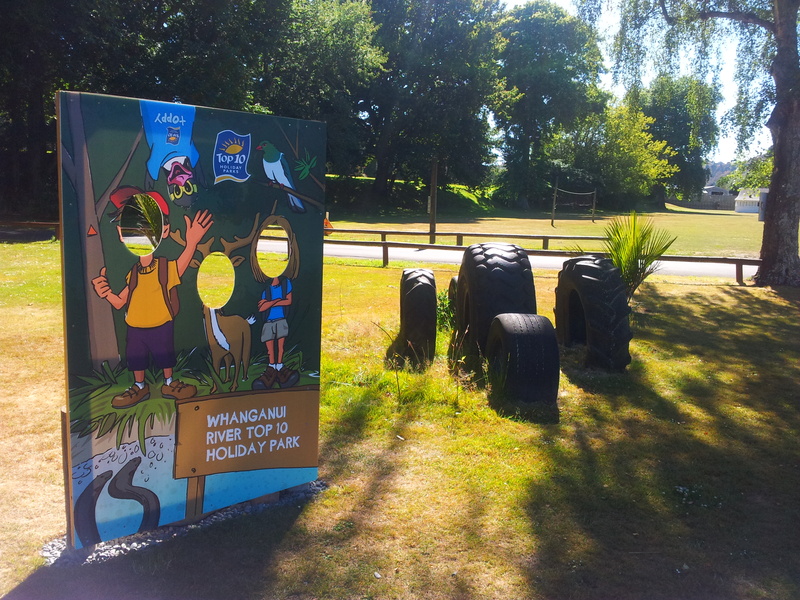 Fortunately the holiday park next door has stepped in to fill the gap and has a pretty good playground all of its own. Cards on the table: it will cost you $5 per person so it’s a special occasion sort of thing. We went there in the name of research for this blog and I’m so glad we did, as Sausage and I had a ball. Firstly, I apologise for the rubbish photos. When we got there I realised I’d left the camera behind so these were taken on my phone. Anyway, back to the playground. 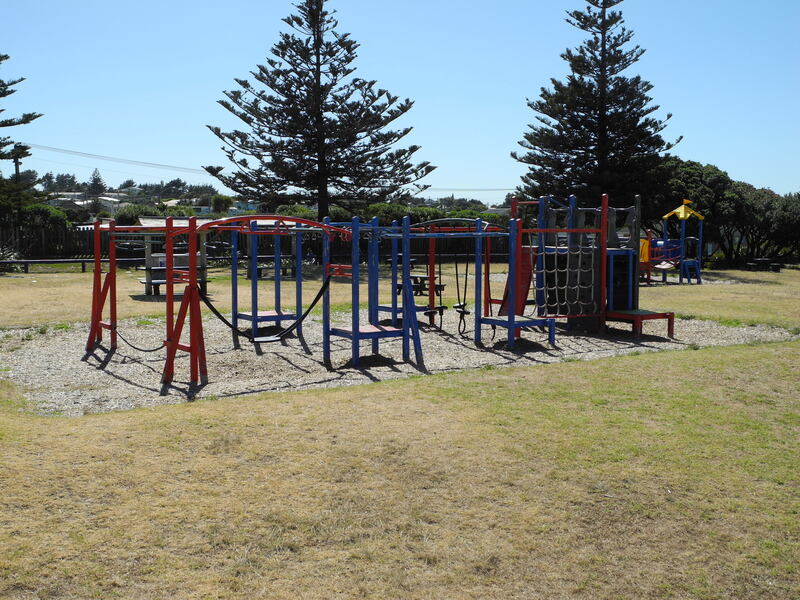 $5 gets you all-day entry to the holiday park, which includes the playground, pool, games room, kitchen and dining facilities and use of the gas barbeque. The holiday park is neat and tidy and was quite busy on the day that we were there. 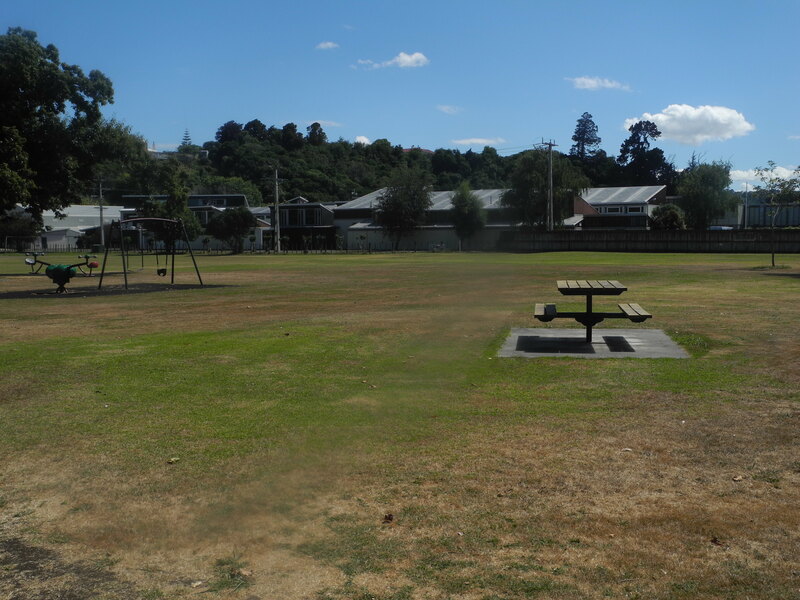 There are plenty of picnic tables and shady trees, and fabulous views of the Whanganui River. If you have school-aged kids you could probably hole up there all day, just for something different. 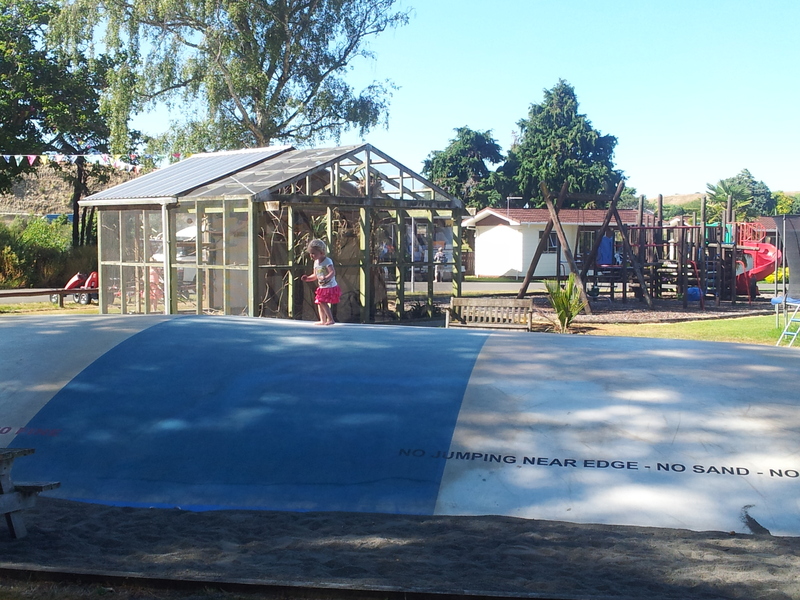 The main attraction of the playground is its gigantic ‘pillow’ trampoline. You could fit a whole classroom of kids on that trampoline and still have room for more. It’s perfectly fine for adults to use (hurrah!) so Sausage and I spent most of our time at the park jumping up a storm while Chip slept in his pram. Sausage LOVED being able to play with me in this way and I got an awesome workout. The trampoline is surrounded by sand, and the park owners have thoughtfully supplied some sandpit toys for tots to play with while they are there. There are a couple of kid-sized picnic tables and a bench nearby. The trampoline is well-shaded by nearby trees. There is a small bird aviary (visible in the photo above) filled with brightly coloured birds who all looked well cared for. Next to the ‘pillow’ is a regular trampoline with mats and a safety net. Going by the amount of injuries I inflicted upon myself on our trampoline as a kid, I think those nets are a genius idea. 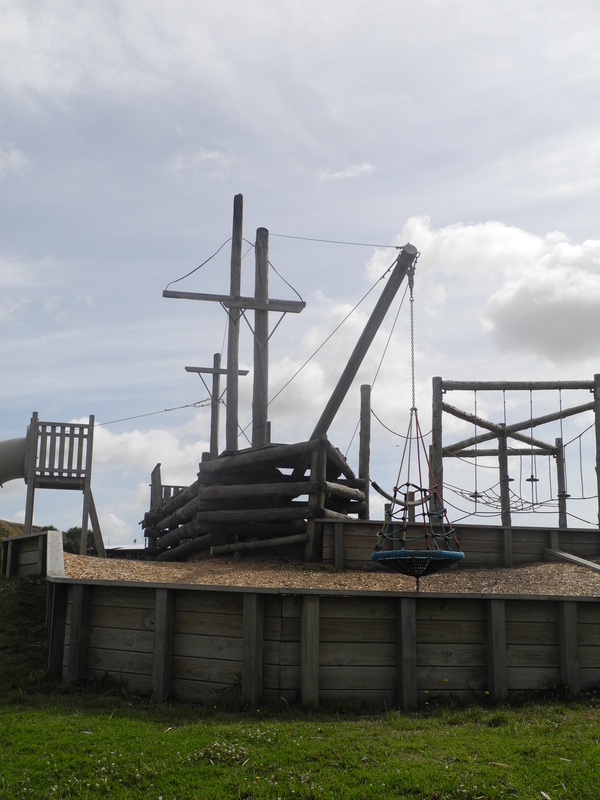 There are two swings – one bucket and one regular, and a cool climbing frame which has a swinging log to access the platform, and two curly/wavy slides. 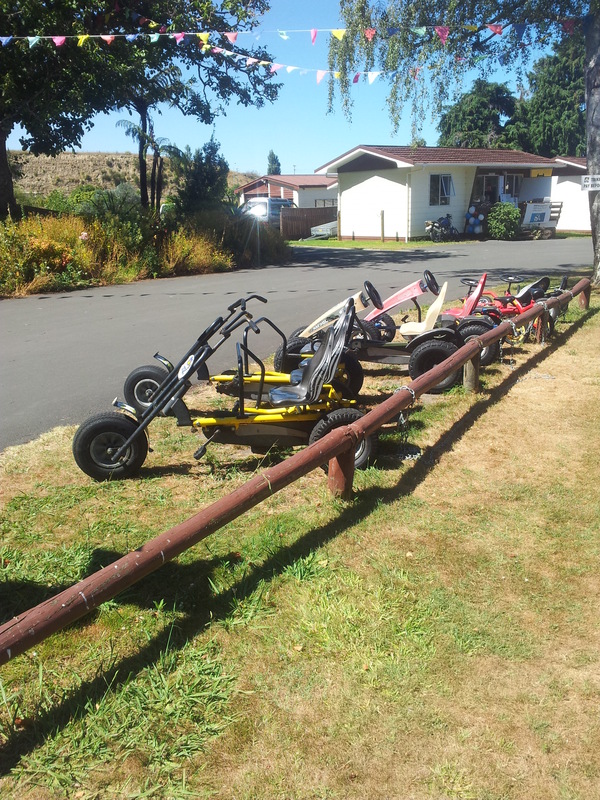 The holiday park also has a range of trikes that can be hired ($5 for 30 mins), and offers paintball (from $30) and kayak hire ($20 an hour) as well. Access to barbeque and kitchen, showers, toilets etc. It costs money. Fair enough, it’s a business, not a council-run playground. But if it wasn’t for the giant pillow, I probably wouldn’t go there just to use the play equipment. It was cool, but there are plenty of just-as-cool free playgrounds around. The other cool things on offer there cost money too. I was lucky to escape demands to go on the trikes. 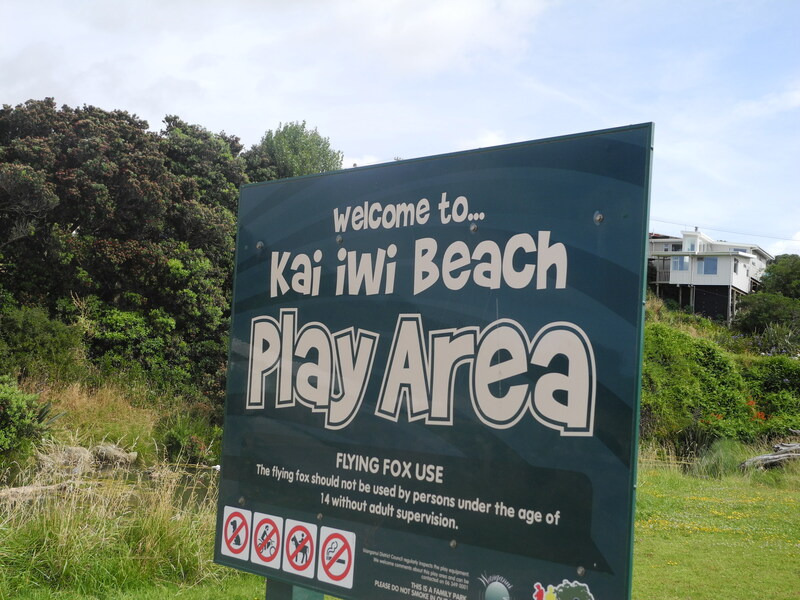 Kai Iwi Beach was my favourite place to go swimming as a kid. 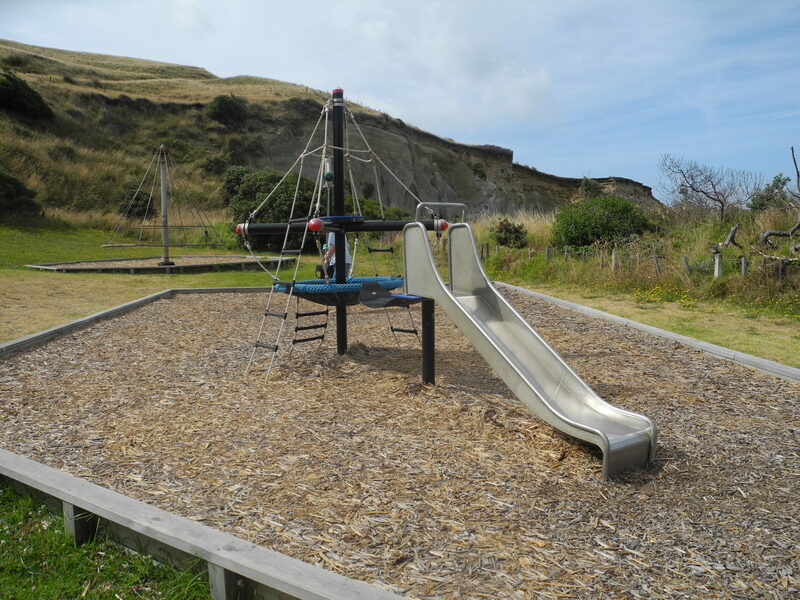 Situated at the small settlement of Mowhanau, Kai Iwi Beach is a mere 15 minute drive from Whanganui. 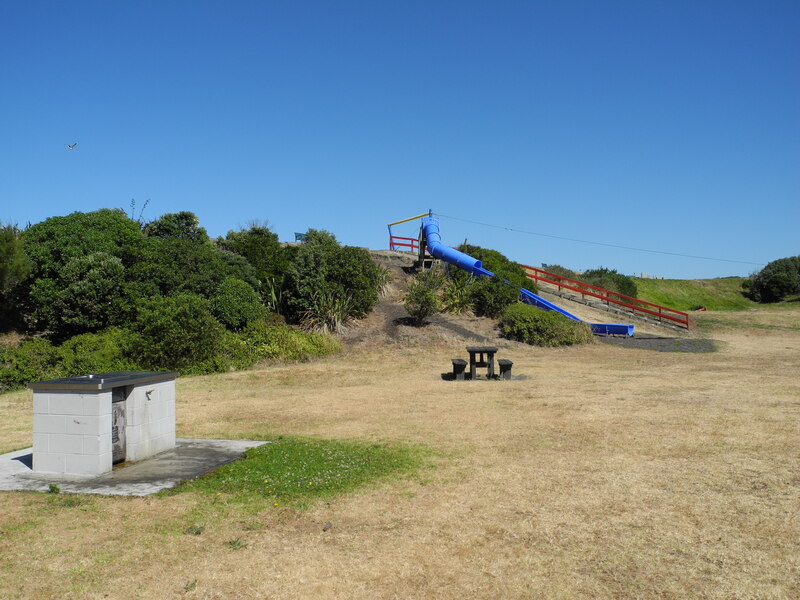 It’s very popular with young families due to the playground and gentle stream flowing out to the beach. The stream is perfect for tots to muck about in and for older children who aren’t confident swimmers. My family and I whiled away many a summer’s day at this beach. Umm, what? 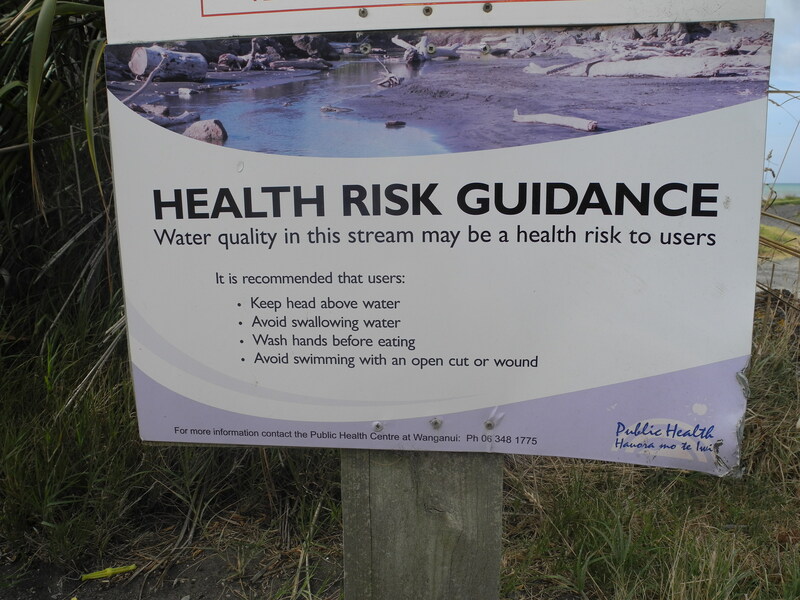 I can’t find any information online as to why the stream isn’t currently safe for swimming (Jan 2015), but I did find an article from 2012 which blamed toxic blue-green algae producing high levels of E. coli in the water. Come on Whanganui District Council! This is absolutely disgraceful! Kai Iwi is by far the most popular beach in the area. We didn’t go into the stream at all as I didn’t want to risk it with a baby in tow. Anyhow, rant over. Onto the playground! While the slide of my childhood has been replaced by a bigger, better structure, I am convinced that this witches’ hat is still the same. 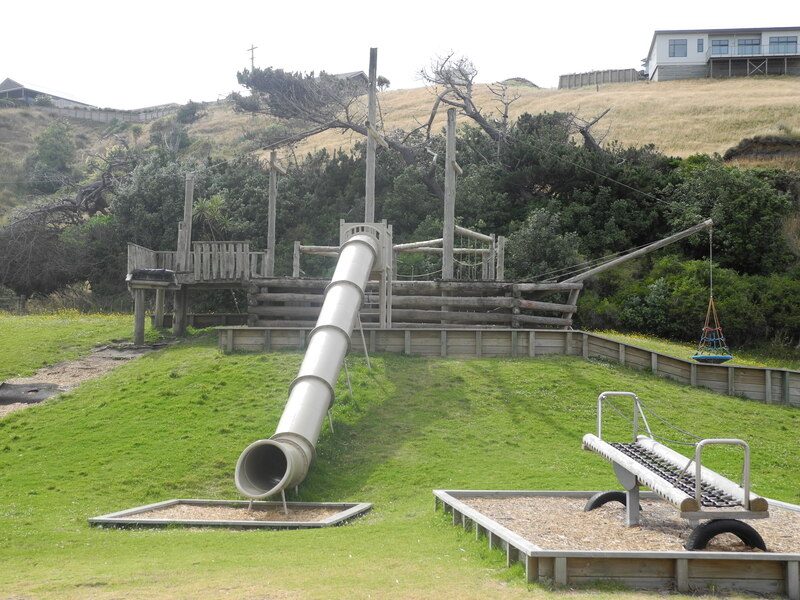 The original slide has been replaced by an awesome boat structure which has several climbing areas, a flying fox, a swing and of course, a slide. There are regular swings and a rope climbing frame, a couple of charcoal barbeques, and several picnic tables close to all the action. 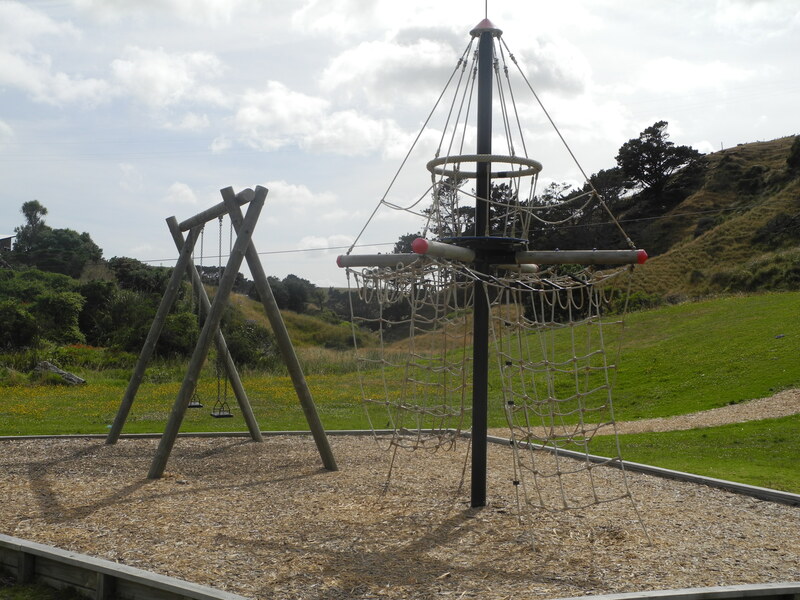 Castlecliff Domain is one of Whanganui’s absolute gems for families and large group events. 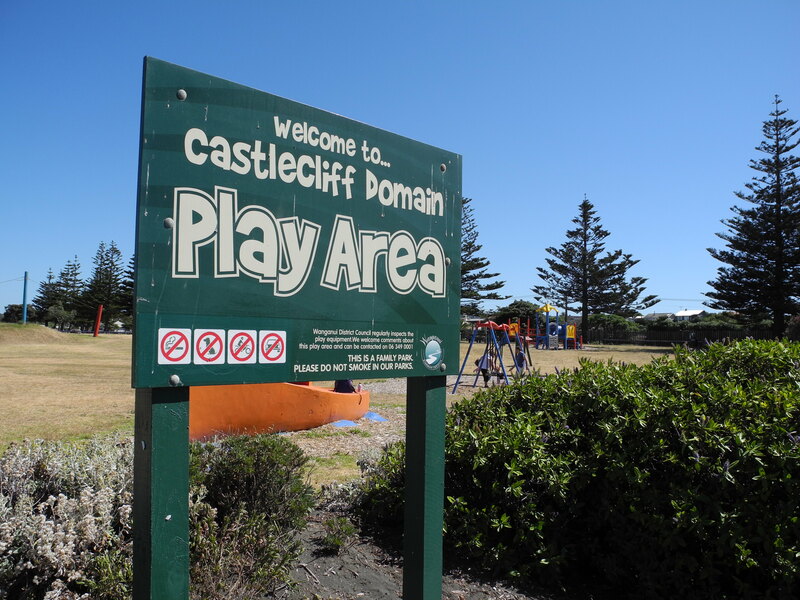 Located on Seafront Road in the suburb of Castlecliff, the Domain is a hop, skip and a jump away from the beach. 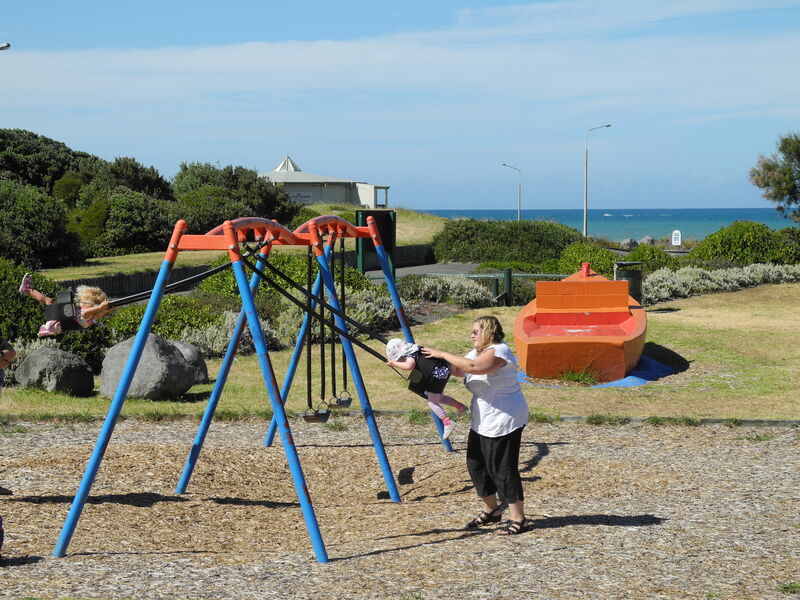 The Domain play area is a fantastic spot for all ages. I highly recommend this playground if you’re having a big get-together with a mix of ages. There is something to keep absolutely everyone happy. 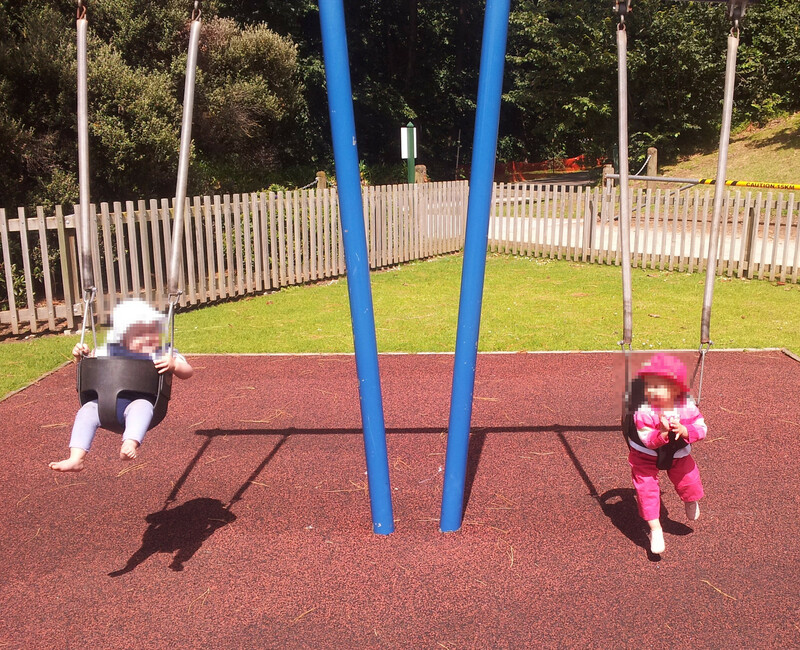 There are bucket swings for tiny tots and regular swings. 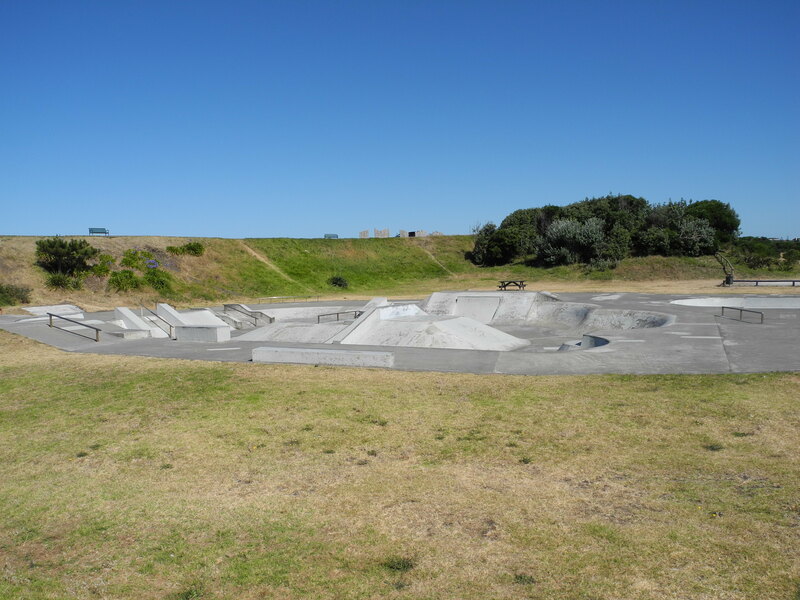 A skate park, a basketball court, a couple of gas barbeques, and plenty of benches and picnic tables. 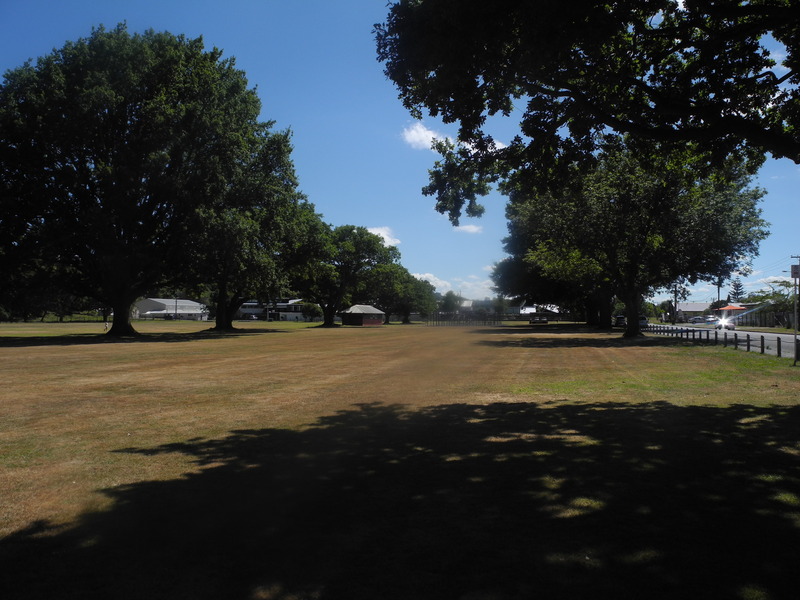 Just past the play area is a long expanse of grass which is perfect for games, or just to sit somewhere shady.